I was never great at math, but I live with a theoretical physicist who sometimes likes to remind me that mathematics is the language of the universe. That said, arithmetic is to math what tax law is to government; both are essential to their respective fields, but absolutely dull as toast to work through. But brain training games are supposed to be good for us, right? So how do you make arithmetic fun? This is the problem confronted by the sleek and futuristic Numulus. Plunging into the dark realm of math apps, Numulus feels much more like a puzzle game than a dry educational tool. 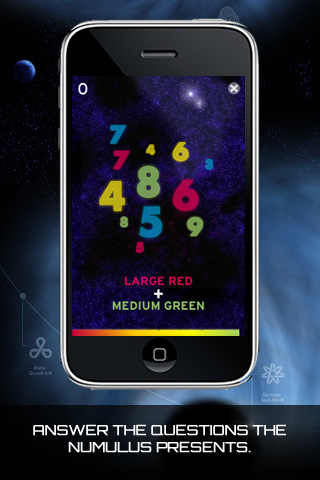 Each level gives you a small number “cloud”, where the numerals are all different colors and physical sizes. There’s also a math problem for you to solve, which might look something like “Small Green + Medium Blue”. From there, it’s almost like a hidden object game, since you have to identify which numbers are the “Small Green” and “Medium Blue” before you can add them together. But don’t wait too long, since the goal is to solve as many math problems as you can before time runs out. The number cloud also changes with every new problem, so it’s easy to get flustered or confused if you’re not paying close attention. It becomes quite a brain workout, and there are four different difficulty levels in all, some of which need to be unlocked by doing well in earlier levels. The first levels start out with only two numbers and addition or subtraction, but later levels get much more challenging, throwing in more numbers and more complicated operations. The relative challenge is enough to make me wish I’d paid more attention during math class, but that said, it’s a lot more engaging and dynamic than your average math game. The fast pace really forces your mental arithmetic skills to improve pretty rapidly, and the minimalist gameplay also makes it great for everyone. Additionally, the dark, futuristic design means your kids won’t feel like you’re stuffing a cheesy “educational game” down their throats. It looks a lot more like Dark Nebula than Mother Goose’s Marvelous Math Magic, but it’s still plenty kid-friendly. Overall, I enjoyed Numulus for its novel approach, but the one thing that drove me absolutely batty was their keypad arrangement. Instead of the usual keypad layout, they’ve flipped the numbers so the smaller numbers are at the top. It just added an unnecessary layer of distraction that caused me to multiple errors and completely messed with my intuitive sense of how a keypad worked. I hated this seemingly minor detail more than I can say, and I sincerely hope developer Pedro will correct this in the future. Beyond that, I was fairly pleased with Numulus. 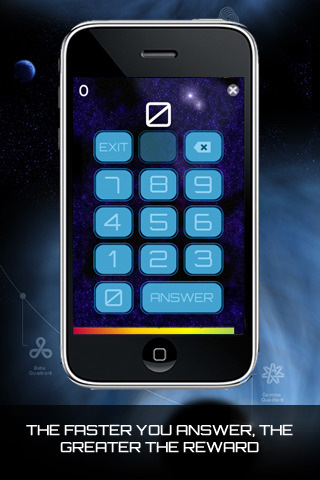 It’s a straight-up lesson in basic math masquerading as a sci-fi puzzle game, but it works. Like Alphabetic, Numulus takes a simple concept and turns it into something fun, but this time, you also learn something in the process. Plus, it’s a Universal, Retina-display ready app, that comes with Plus+ social networking, and it’s only $0.99, so start brushing up on those multiplication tables already! AppSafari review of Numulus was written by Tracy Yonemoto on November 1st, 2010 and categorized under App Store, Education, Games, iPad apps, Puzzler, Universal. Page viewed 4656 times, 1 so far today. Need help on using these apps? Please read the Help Page.